Small appliances and gadgets are often a huge source of kitchen clutter. Here, I'll show you how just one item can help you declutter and streamline your entire kitchen! Most of us have at least a few different small appliances in our kitchens. While almost every small kitchen appliance does something you can do on your stovetop or in your oven, we buy them because they offer added convenience that traditional methods can’t match. But after a certain point, those convenient appliances start to become an organizational nuisance. After all, each of those “small” appliances takes up a certain amount of room! And to learn even more about this incredible cooker, check out my eBook Everything Instant Pot! This handy reference guide is packed with tips and tricks for both beginners and experienced users alike. You can find it in my shop, or get it for free if you’re an OGT Plus member! The Instant Pot is an electric pressure cooker, so the most obvious tool it can replace in your kitchen is your old stovetop pressure cooker! With 10 safety mechanisms, the Instant Pot is much safer (not to mention more consistent and user-friendly) than the stovetop variety. Pressure cooking is one of the best ways to enjoy deliciously tender foods in a fraction of the time of other methods! I highly recommend investing in a glass lid like this one to use when slow cooking in your Instant Pot. It works just like any other crockpot lid does, releasing excess steam while retaining as much moisture as possible during cooking. Want a more thorough explanation about how the Instant Pot differs from a crockpot? Get all the details at the link below! 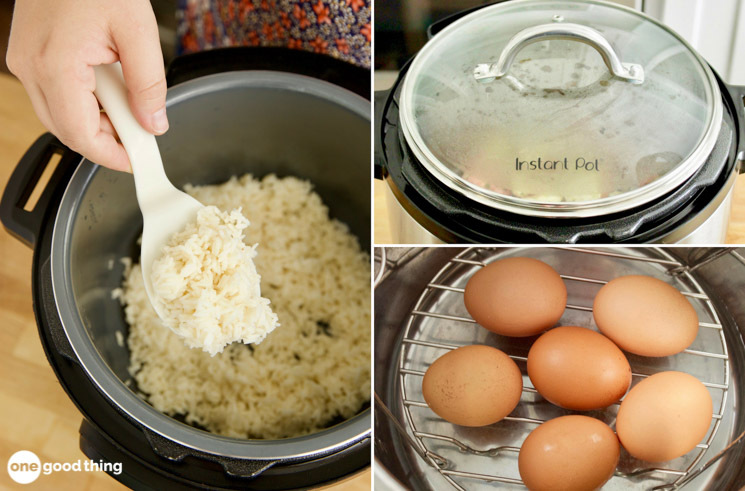 Rice is the one food I cook most frequently in my Instant Pot, by a long shot! Rice is a great side dish for many of my family’s favorite dishes, and cooking it in my Instant Pot takes next to no effort. And the best part is that the rice is perfectly cooked every time! And while you can also make perfect rice in a rice cooker, it takes longer to cook than it would in an Instant Pot. To get the full step-by-step instructions on how to make delicious homemade yogurt in your Instant Pot, read my full post on the topic at the link below. Replace any steamer device with the Instant Pot, the perfect tool for quickly steaming vegetables and fish. It’s really quick, and can perfectly steam even the most delicate foods! There are a variety of steamer baskets you can buy online to use in your Instant Pot, like this mesh steamer basket. There are also stackable steamer baskets that allow you to cook steam multiple foods at once! Your Instant Pot can replace anything you might use to keep food warm, whether it’s just until dinnertime or throughout a whole party! The Instant Pot has a “Keep Warm” function that turns on after pressure cooking, but you can also turn it on manually any time you want. Keeping soups, dips, and other foods warm is a breeze with this handy function! The “Sauté” program on your Instant Pot is such a brilliant addition to the versatile machine. While you can pressure cook raw meat as is, searing it beforehand helps to give it a deeper flavor. The “Sauté” program allows you to sear your meat right inside your Instant Pot so you don’t have to use one of your clean pans doing it on your stovetop! You can also use the “Sauté” program to thicken sauces and soups after pressure cooking, or even to make stir-fry! And the Instant Pot 8-quart Aura Pro model is shaking up the game even further! If pressure cooking isn’t your thing, you can grab this multi-cooker that includes a super useful a “Sous Vide” program! Cooking sous vide yields some of the most tender, perfectly cooked foods you’ll ever taste with zero guesswork required on your part. My dear friend gave me the 8 quart Instant Pot for Christmas and I’ve enjoyed using it. I’ve got a large family to cook for and I’ve thought of getting a second one in order to cook rice and whatever main dish I’m serving that day at the same time. I love that it cooks so quickly but I don’t feel like it’s as reliable as my slow cookers. I’ll never part with those! I use my ‘Keep Warm’ function to reheat food as well; straight from the fridge. Just put your food in there and press the button. I put the lid on and walk away but if you want to stir and watch over it you could probably leave the lid off. Your choice. And there is no pressure build up so no wait, just open the lid and serve. If I get side tracked it keeps the food at that perfect temp, no worries. I know this is an older post. But, I recommend the ninja Foodi :) does everything an instapot does and also dehydrates, and air fries:) I have had electric pressure cookers since before there even was an instapot.. it’s just a brand, there are others that do the same thing. QVC even has there own. You would probably also get good use out of a toaster oven. Before the instant pot it was my go-to for cooking small amounts of meat, chicken or fish (fish doesn’t even need to be defrosted) and you can throw a few veggies in the tray with them. Then there’s leftovers for lunch or freeze a meal for another day. Perfect if you’re craving chicken with the crispy skin -spray with cooking oil and sprinkle with Cajun spice, simple! If there’s another instant pot post, I may have to unsubscribe. I Like theses posts, and you don’t have to read them. I want to get an Insta Pot and I am learning. Skim over them and read Jillee’s other amazing ideas. I simply don’t read them and concentrate on subjects in which I am interested. I bought a pot that does all the instant pot does. I don’t need or want the instant pot. To me tis a fancy rush to get and in a years time just something else to have to move so I can get something behind it. And oh it is a pressure cooker also. My son the chef loves it. So you like it or don’t like it? ??? Tell us what it is that you have found. Would really like to know. Jody?.